Hôtel Concorde Montparnasse is a modern hotel built in 2004, with an architectural style which suggests forms of contemporary Paris. The outside of building with large windows give to rooms and hotel facilities a great luminosity. Into its inside, the Hotel Concorde Montparnasse offers comprehensive facilities among which stands out a warm and welcoming atmosphere. All rooms of Hôtel Concorde Montparnasse offer everything you can expect from a great business hotel in a big city like Paris. The rooms are fully equipped and have high quality furniture and generous space to ensure you a flawless break. With a design in warm colors, the classic room offers a double bed, internet access, kettle, minibar, clothes iron and television with cable channels among many other amenities. The room provides spectacular views of the hotel grounds. Have the same facilities and comforts as the classic rooms, the main difference resides in the location of these rooms, because the superior rooms are overlooking the city of Paris, so you will get spectacular views of the city from your room. 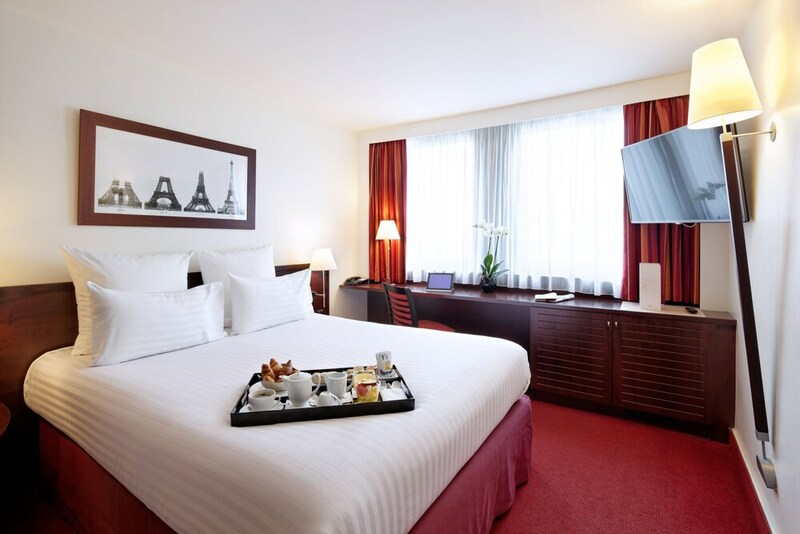 The deluxe room offers greater and better comfort due in large part to its greater space, a sofa bed, its bigger bathroom and the luminosity that it counts, some of these rooms are overlooking the Eiffel Tower, so you can appreciate the most important attraction of Paris at any time. The hotel offers a comprehensive list of facilities like meeting and conference rooms, parking for up to 70 vehicles and access fully adapted for people with reduced mobility. In addition, the Hôtel Concorde Montparnasse offers internet on all its zones. Thanks to its location Hôtel Concorde Montparnasse is also perfect for travelers who wish to explore Paris, for example, the Louvre Museum is 1.6 Km and the Eiffel Tower is just 2.4 Km.